I was at J.Crew today. Noticed the t-shirt display. Pic #1. I fell in love with their new watermelon Fair Isle with white, navy and light blue accents. Popped it on, adored it semi-tucked with high rise jeans, and decided to give J.Crew another chance this year - and HOPE it doesn't pill. 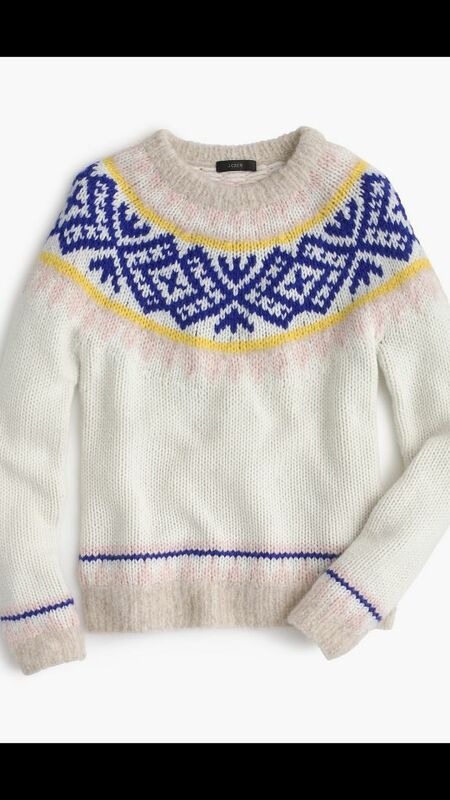 (Would have bought the Boden Fair Isle , but the colours are too cool toned for my complexion). I like that the neckline is pearl-friendly. And that it's a slam dunk with my watermelon and light blue Furlas, and of course - white boots! Soon I'll have a new pair of watermelon specs that will match nicely too. Fun to be part of Team Fair Isle, Smittie & kkards. Fair Isle comes in three colours. Very fluid body fit, but tapered on the sleeves, shoulders and hem. Just enough structure. Longer than the Boden Fair Isle. Lovely on you, Angie, the color is very fresh. I have a subtle cream Fair Isle sweater from a couple of years ago and trying to decide if I want a bolder one, too, or that is enough. Love your new specs! Thanks, Tanya. I remember your cream Fair Isle and love it. (I'll model my new specs as soon as the prescription lenses are in). Doesn’t feel right for my style, but I quite like the gray one! The red is perfect for you, though! It is very nice on you! That looks super on you. The watermelon reminds me of your watermelon lace dress, which I also love. I seem to have a soft spot for fair isle sweaters & lace. I just wore a take on one the other day. And got the other at trusty jcrew 2 years ago. Adorable. Can't wait to see you in your new glasses. Love that happy red. Very fresh and pretty on you ! Is “Watermelon “ your new red ? Or is this in addition to tomato red ? Gorgeous. So cheery for a winter night in or a walk and brunch in the weekend!! Super! What a great colour and I’m sure it looks wonderful with your jeans. Wonderful color on you and with your accessories. Grab our colors when we can, as you say! And great happy- factor for chilly gray days. This is a sweater to make people smile when they see you. The red could be a good color for the holidays. Is the dark part black or navy? Can't wait to see the new glasses in action! Watermelon fair isle is the perfect mix of cheer. Love the pro-voting display too. Love it, lights up your face your beautifully. Very pretty on you ! Very lovely! Watermelon is perfect for you! 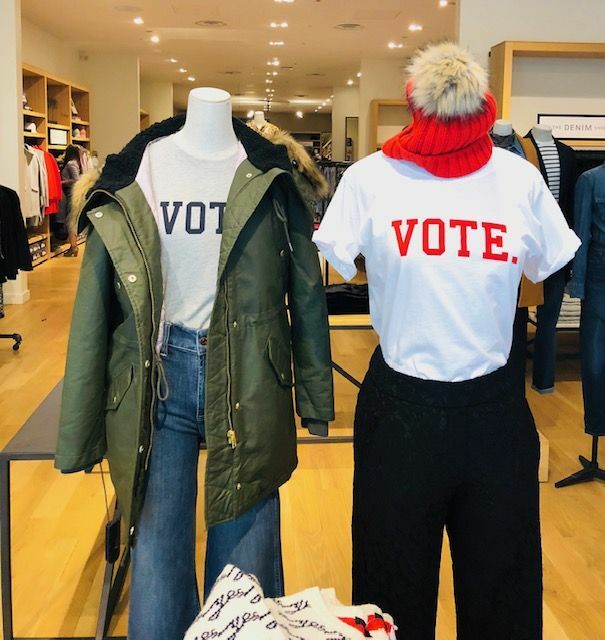 Loving the vote t shirts! Soooo pretty on you! Beautiful colour. Interesting vote t shirts. You look like tr-r-rouble ! You look gorgeous as always, Angie! And slightly off-topic: I am currently knitting my own Fair Isle sweater! Or an Icelandic lopapeysa to be more precise..
Looks good, Angie. I was in JCrew last week and apart from these, I found the store a yawn. 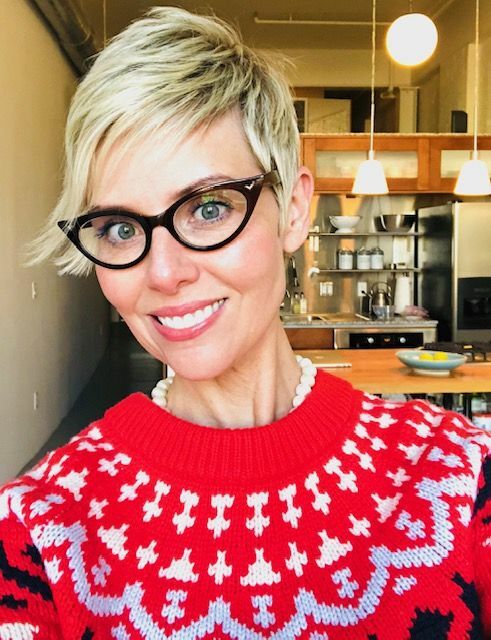 Having been caught with a large investment in sweaters destined to pill after 3 wears several years ago may continue to impact how receptive I am to JCrew in general. Fingers crossed that they have upped their game and I look forward to your feedback on this over time. If I lived up there I'd even get one of those ugly Christmas sweaters ! Very nice and good service by the store manager.Love the colour on you. LOVE the watermelon on you! Beautiful!! These awesome finds are making my "no shop" November and December VERY challenging! Great color for you, and nice of them to give you the discount Looking forward to the watermelon specs! OMG, Angie- this sweater is just gorgeous on you! L.O.V.E. it is that very speciffic bright red&has lot of WHITE! Wow!! 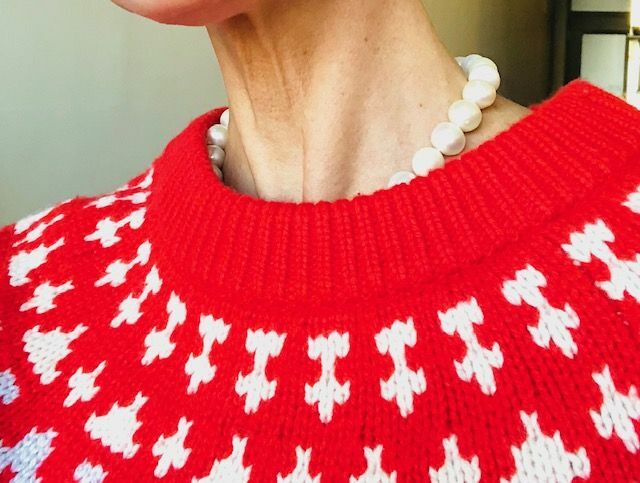 You also say "neckline is pearl-friendly" but is it specifficaly and in exactly that way you show in the picties- so only showing them off partially- is that deliberatedly a more fashionable and/or a more subtle way for showing off pearls on a neckline? Anyway, I just love it!